Beyond doors, windows are an easy access point for burglars and intruders. To maximize your security, A Straight Up Fence Company in Denver can fabricate and install window security bars and well covers. During your initial consultation with one of our specialists, we’ll assess your entire property to provide you with a complete system, including fences, gates, security doors and window solutions. Whatever level of security you wish to achieve and whatever style you prefer, we deliver peace of mind. Too often, people think that having secure windows means giving up aesthetics. We can fabricate security bars to look great with your home’s style and colors. All bars come powder coated to a 3 mil. thickness for rust prevention and can be color matched to any look. When securing your basement windows, egress capabilities are mandatory. For this application, we’ll install a push button inside the house that frees a lock on the bars and allows the bars to freely swing open on their hinges. Another crucial component of home security, window well covers from A Straight Up Fence Company can be custom-fabricated to fit any opening. While some newer window wells come with ready-made covers, most are odd shaped or don’t conform to a standard size. Because we design and weld from scratch, we can provide both beauty and security for your window wells. Have an egress window? We can also customize the cover to be locked from the outside but easily opened from the inside. 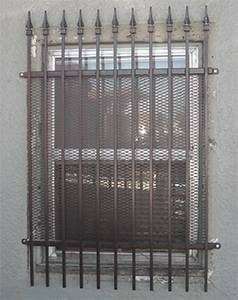 Need Window Security Bars and Well Covers? At A Straight Up Fence Company, we can custom-fabricate window security bars and well covers for any home or business here in Denver, Boulder and across the Front Range. Don’t leave your safety to chance when we can provide window solutions that look great and help keep any home or building secure 24/7.